PEOPLE THINK I’M A GARDENING EXPERT. I know this because I’m always being asked questions. I answer those I can, even if I have to make an educated guess. Some, I can’t answer as I don’t have knowledge or experience about their specific plant oriented query. More specifically, I know little to nothing about non-edible plants. If I can’t eat it, I try not to learn about it. There’s only so much room in my little brain for all this botanical information. People believe I’m a gardening expert because I write about it and seem to know what I’m talking about. In reality, I’m just a guy who has failed more than they have. I’ve made small missteps and giant mistakes. I’ve blundered forward, trying new things without proper research, and have been taught by the school of hard knocks. My primary writing motivation is to advise others before uninformed missteps are made. So, without further ado, here are some of my biggest doozies. for a few weeks. I usually leave it in the garage as it’s both dry and warm. Once it’s ready, I cut off the tops and store the bulbs in mesh bags in my kitchen. The biggest bulbs are used for planting the next fall and the remainder fill my belly over the year. All very easy peasy. In the above instructions, I left out a small, but important detail. The first time I grew garlic, instead of looking up how to do it properly, I planted it like I had done previously with onion sets; with the whole bulb buried in a few inches of dirt. Garlic is different from onions in that garlic bulbs are made up of many cloves. If you cook with garlic, you already know this. I, for whatever reason, did not. 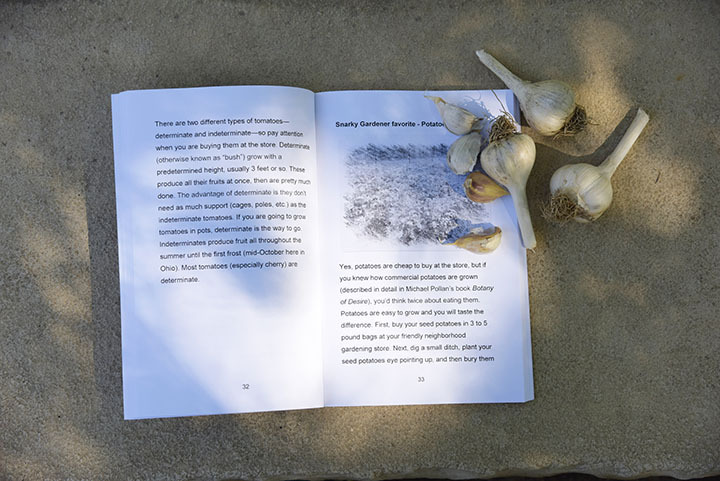 In order to properly grow garlic, you plant the individual cloves, using the biggest of them and eating the smaller ones. I didn’t discover my mistake until spring when it was too late to do anything about it. Instead of having separate garlic stalks two to three inches apart, I had crowded clumps all growing together. I did dig a few out to move them to more hospitable distances, but the damage was already done. The following year, a wiser me planted them correctly and have been reaping the benefits ever since. STARTING YOUR OWN PLANTS from seed is a milestone in a gardener’s “career”. The veggie that lends itself to starting yourself is the ubiquitous homegrown tomato. Of course you can purchase starts in May at a local greenhouse or big box store like the rest of the lemmings, but raising your own little guys is, quite frankly, liberating. There are hundreds (if not thousands) of tomato varieties one can purchase online. 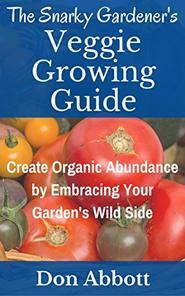 Plus, you can save seed from this season’s tomatoes for free seed if you are growing non-hybrid types. Actually, you could technically plant seed from hybrids (otherwise known as F1s) but you wouldn’t know exactly what kind of fruit they would produce. Who doesn’t like a good mystery that you can eat? OREGANO is in the mint family, as is peppermint, spearmint, lemon balm, thyme, rosemary, sage, and basil. Only basil and rosemary have issues surviving our Northeast Ohio winters, so the rest come back year after year as perennials. Some mints are known for their invasiveness, especially peppermint, spearmint, lemon balm, and the aforementioned oregano. I knew this about peppermint, and made a concerted effort to plant it where it wouldn’t escape. Yes, when talking about mint, we gardeners talk in terms of a plant’s ability to get away. I didn’t heed the warning about oregano, and to a lesser extent, lemon balm. Oregano has not exactly taken over my regular veggie garden, but it does have quite the presence. I think what really does me in is when oregano flowers bring all the bees to the yard. Bumblebees, honeybees, and native bees of all kinds. I hate to remove something that feeds our little pollinator friends. Of course, this means pollinated oregano turns into millions of seeds, which cause even more oregano flowers the next year. I WROTE A GARDENING BOOK IN 2017 named “The Snarky Gardener’s Veggie Growing Guide”. It can be found on Amazon in both paperback and eBook forms, if you are so inclined. Writing a book is not a trivial task, as there are plenty of pieces one needs to put together to make it a success. First, you have to write, which is obvious but needs to be mentioned here. Most people don’t give much thought past this point, but there are many more steps. Once the budding author finishes writing, there is as much, if not more, work with the editing process. This is difficult for the writer to do by himself, as people tend to gloss over what they are familiar with. I did have several different individuals go over my book, helping me to clean up both the writing and the formatting. Nobody likes it when the picture is on one page and the description is on the next. eBooks are easier because if you find a mistake or want to add a little more to the book, you just make your changes to the original document and then upload it. Physical books are worse as once a boo-boo is in there, it’s there until the next print run. With Amazon, they print up a small number ahead of time for quick shipping, but you can have corrections added. My point is that I had thirty or so books shipped to me for book signings and Christmas gifts (spoiler alert for my friends and coworkers). A few months after this initial shipment, I was randomly looking through a book when I found this doozy on page 32. Most tomatoes (especially cherry) are determinate. Which is a big, fat, giant lie. 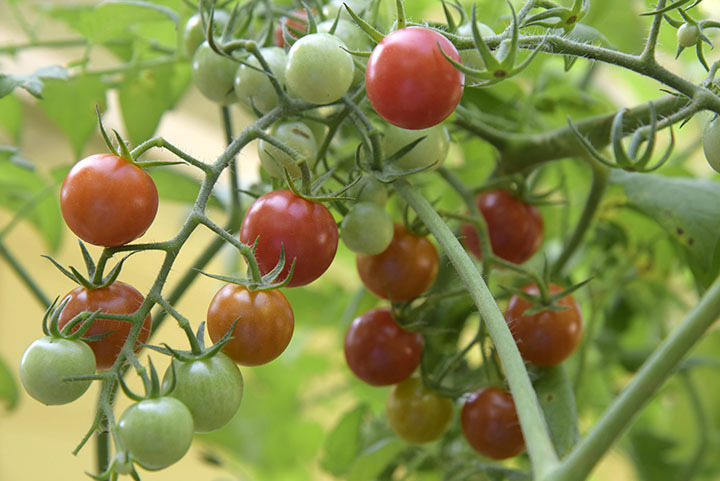 Most tomatoes are indeterminate, which means they grow until a fall frost hits them. This goes to show you that even a gardening expert like me can make mistakes. The best part of these human errors is they can be fixed, except for those of you who bought the original edition. For you, either go in with a marker and add “in” or keep it the way it is so you can cash in with this first print version, once I become famous beyond Kent, Ohio. I know that’s a long shot, but you never know.